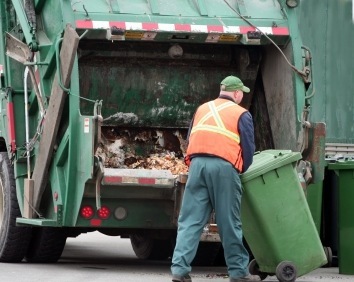 Our regular garbage pick-up day is Friday but we're wondering whether today's holiday, which is the Christian Good Friday will change the schedule. One neighbour has the blue boxes out yesterday, just in case. but no one else followed the lead. Crucifixions were not uncommon at the time of Jesus, and both Jewish and Roman sources provide the gruesome details of how they were performed. First, victims were often brutally scourged with a whip called a flagrum. University of South Florida biblical archaeologist James Strange estimates that 40 blows would have been a normal punishment, which was sometimes deadly in itself. The Gospels say Jesus was forced to wear a crown of thorns as he carried the beam of his cross to the place where he would die, probably mocked by Roman soldiers along the way. Although the exact route to the crucifixion is in unknown, there is general agreement that it took place at Golgotha, a garbage dump outside Jerusalem. The apostle Paul accepted and redeemed this grim reality, including what was probably a hymn of the early church in his letter to the church in Philippi. Jesus was not a victim who was tossed in the dump. In his humility -- not humiliation -- we are redeemed in Christ and set free.